The central bank of Rwanda has launched its own securities exchange in the country's capital, Kigali. Initially it will deal in corporate and treasury bonds, but the Bank says it will include other products such as shares as the operation develops. Upon opening the Rwanda Capital Market, President Paul Kagame described it as a milestone for the nation. The hope is that the exchange will aid the economy, which has yet to bounce back after the 1994 genocide. "It's an important achievement which will provide the business community with a second option to financing that is long term and which will inevitably add great value to our economy," President Kagame said. More than 800,000 people were killed and the country's infrastructure was destroyed in the civil war. The securities exchange is being seen as a source of cheaper financing than that offered by commercial banks. The central bank's governor, Francois Kanimba, said that at first the stock exchange would only be open to Rwandan companies. Many businesses from the country's manufacturing, mining, tourism and real estate sectors should eventually be listed on the stock exchange, he envisaged. 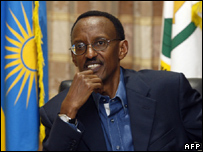 In time, foreign companies will be allowed to enter, either to raise finance by listing in Rwanda or to buy shares. Last week the bank issued treasury bonds worth more than $36m to support the stock exchange project.